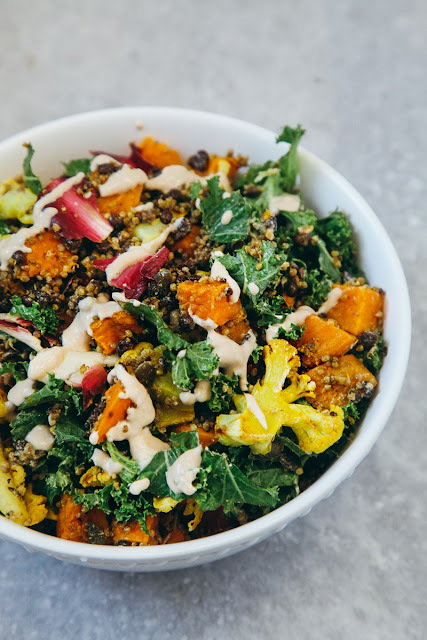 A super delicious salad with roasted vegetables, quinoa, lentils, kale & a creamy tahini dressing. Preheat the oven to 180C / 350F and add the olive oil to a large roasting tray. Add the squash or sweet potato and toss in the oil. Roast for 10 minutes. Then add the cauliflower with the spices, salt and pepper. Roast for a further 20 minutes. Meanwhile, add the cooked quinoa and lentils to a large bowl and mix in the kale and radicchio leaves. Once the veg is cooked and cooled slightly, mix into the salad with the leaves, quinoa and lentils. Simply mix everything together until smooth. Taste and add a pinch of salt and pepper, if needed. If it's too thick, stir in some more hot water. Pour over the salad and use your hands to rub it into the leaves and mix it in well. (optional) Top with a mixture of seeds, such as sunflower, chia and pumpkin seeds for added crunch and protein. Serve and enjoy! Can be kept in a container in the fridge for up to three days. 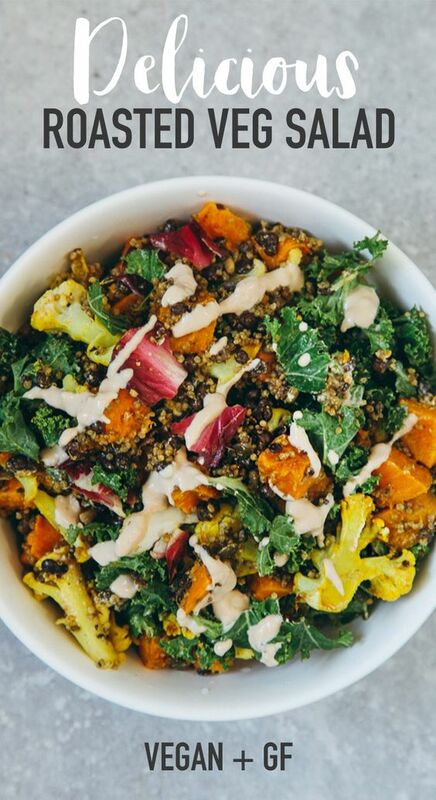 0 Response to "ROASTED VEGGIE & QUINOA SALAD WITH TAHINI GARLIC DRESSING"